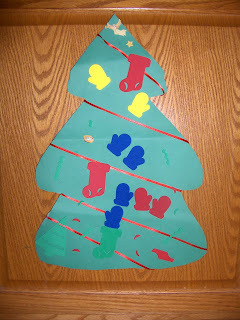 Nathan had to create this tree for school. We were to decorate it however we wanted. After he had fun with the foam stick-ons (thank God I got those on clearance last year), he wanted an angel and a star. I found some stickers so he put the angel on the top of the tree, the star next to the top and then he picked Baby Jesus in the manger to complete the tree. I submitted his tree to my friend (and author) for her blog. Cheryl St. John is running a 'Christmas Tree Tour' on her blog. Nathan's tree was the top of the page for almost the entire day yesterday. When Nathan heard of Cheryl's "Christmas Tree Tour", he asked, "Do you think Miss Cheryl will like my tree enough to put it on her blog?" He's very 'into' blogging now that mom does this. He was hoping his tree would be 'good enough' to be on her blog, too. (A big thanks to Cheryl for putting his tree top of page over Carla's tree that comes out of House Beautiful!! It made Nathan's day to be so important on another blog.) And since Cheryl's blog is read internationally, Nathan is now known all over the globe for his beautiful tree.